Begun in 1938 and completed only in 1955, The Public Philosophy offers as much a glimpse into the private philosophy of America's premier journalist of the twentieth century as it does a public philosophy.The basis of Lippmann's effort is ""that there is a deep disorder in our society which comes not from the machinations of our enemies and from the adversaries of the human condition but from within ourselves."" He also provides a special sort of legacy to liberalism in its broadest sense - as the root approach to human existence that could provide civility and accommodation against incivilities and extremism, and that uniquely stood against the totalitarian counter-revolutions from Jacobism to Leninism. 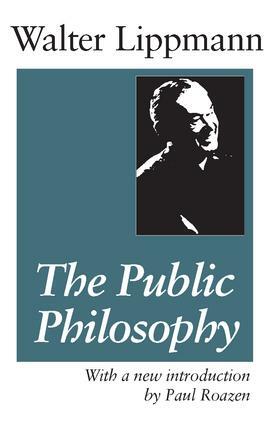 This work is a masterful defense of the public philosophy as a constitutional tradition, and can be easily read as such today.Paul Roazen, long identified with the analysis of Lippmann's work, points out that no matter how trenchantly Lippmann dissected democracy, and the populist faith in the people's wisdom, he still sought to study the world in order to help govern it. His constant flow of journalistic writing had the educative intent of raising the level of the public's knowledge. His rationalist conviction that clearheadedness on public matters can be effectively relayed to people is nowhere more evident than in The Public Philosophy. In this sense it is an argument for the democratic ideal that people can be rallied in defense of the public interest.